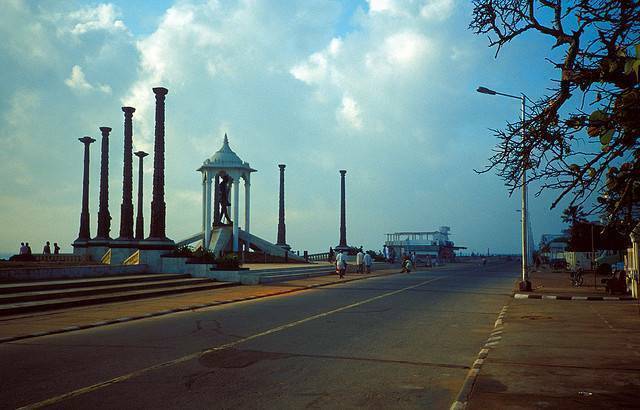 Promenade Beach or Pondicherry Beach is the popular stretch of oceanfront in Puducherry. It’s a 1.5 kilometre long rocky stretch which starts from War Memorial and end at Dupleix Park on the Goubert Ave. The statue of Joan of Arc, the statue of Mahatma Gandhi standing tall, old light house, the remains of the old pier and the famous Le Café beach side Café speak the splendor of the by gone era. The Goubert Avenue or the rock beach road is closed for vehicular traffic every evening.